Kindergarten "Miratorg" declared the winner of the regional competition "kindergarten of the year 2018"
APH Miratorg, the leading manufacturer of main types of meat in Russia, reports that corporate kindergarten "Cozy" became the winner of regional competition "kindergarten of year – 2018" among private preschools in Belgorod region. Miratorg is the largest employer in the agro-industrial sector: the enterprises of the holding employs more than 34 000 employees. Creating a comfortable social infrastructure, including: ensuring corporate housing for young professionals and their families, as well as providing employees ' children places in preschool institutions is one of important directions of personnel policy of the company. 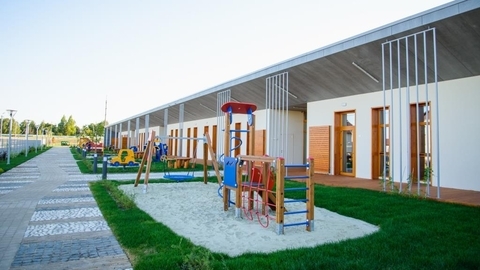 Corporate kindergarten "Miratorg" in "Cozy" built for children of employees of the holding according to the Austrian project. It has everything for a comfortable stay of children, active play, educational activities, and strengthening of physical health: the bright, spacious rooms, many educational and thematic areas, a computer classroom, where the children playfully learn the basics of computer science, the remarkable seven-meter pool where kids are engaged under the supervision of an experienced instructor, music class and a class for language classes, psychologist and speech therapist, and even a sports hall equipped with climbing wall. Preschool education – the basic level of the educational system of the Russian Federation, which largely determines the progress of the child in the primary grades. Therefore, of great importance in kindergarten devote it to education. In 2016 kindergarten licensed preschool educational institutions, and just a year later, the teachers on the basis of these requests, interests and expectations of parents of kindergarten pupils, have developed their own upgraded program involving the comprehensive development of the child. Much attention in the preschool institution is also cultural development: children are engaged in singing, dancing, participate in regional competitions, which regularly occupy the first place. "Corporate kindergarten "Miratorg" reflected the fundamental principles of the activities of the agricultural holding: the use of new technologies and best practices, thus ensuring our employees 'children the best conditions, both in terms of comfort of stay in preschool institution, and of educational activity", - said the press service of "Miratorg".